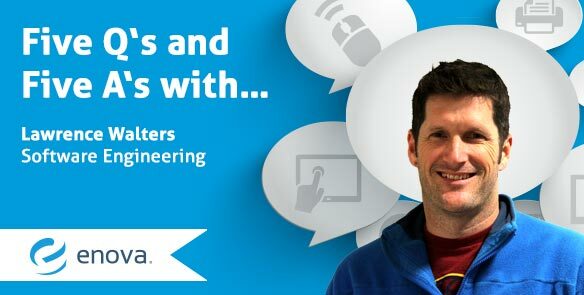 Getting to Know: Software Engineering - Enova International, Inc.
Enova was at the right time and right place for me when I joined in August 2014. I was previously the director of development at an ecommerce consulting firm here in Chicago. Consulting was a fantastic experience, and I had the opportunity to work for a great company, building a fantastic team, as well as working with interesting clients. But the travel required for that position simply didn’t jive with my family – specifically my wife’s career. Along came Enova, and after learning the culture and what was happening here, I was hooked. I sometimes wonder if anyone else got the 1.5 hour “bad parts of enova, so think hard about it” talk from Donnie Hall (my future boss). Everything he mentioned seemed like challenges I had seen before or were clearly outweighed by the important things that Enova is getting right. That was 10 months ago, and I’ve spent a non trivial amount of that time wondering why I didn’t come here sooner! I manage two teams of software engineers, Browncoats and China. Browncoats is the platform and tools team. We own shared services in our service oriented architecture that supports multiple Enova brands. We also provide tools to support developers – like automated virtual machine creation in the cloud – and the software lifecycle – like continuous integration through Travis and Jenkins. Our mission is really to make all of Enova faster at innovating, and it comes down to a lot of collaboration between us, software engineering, and every other department here. The China team is responsible for our installment loan product in China, youxinyi.cn. That product launched last year, and we are learning a lot in that market right now, and our development team here is learning a lot about the special flavor of “international” that is China. It’s been a great experience so far. This is a tough one – there are so many. I think all the best parts come back to the Enova value of “Best Answer Wins.” This makes us a very flat organization. If you have an idea, you can prove its value or figure out a way to prove it is worthwhile, it will be considered. There is no hierarchy you have to traverse to experiment (to be fair, after you experiment, there is some work needed to get things adopted, but there’s very few barriers to “can I try this”?). I feel this also drives our flexible work environment – there is emphasis here on results, however you get to them is generally up to you. Hawai’i. Wait, no, I mean Chicago! So, I would love to live on the beach in Hawai’i, and I really do love the ocean. But it’s far! And having moved to Chicago four years ago, I couldn’t be happier. Chicago has everything my family and I want — great educational opportunities, awesome employers, culture, diversity, city life, people, wind, snow, sun, you name it, Chicago has it. While I occasionally dream of the beach, my heart will now and forever be here, and we’ll just have to take family vacations to the ocean. Funny you should ask, because I’ve been to a desert island, so I have some experience in this regard! Los Roques are islands about an hour flight from Caracas, Venezuela. Each day there, you can hire a boat to drive you out to any number of beautiful sunny and sandy isles. They’ll drop you off, and pick you up later (seriously, they do pick you up!). Based on that experience, my three desert island must-haves are an umbrella, beach chair and cooler of beer! ❮ Welcome Enova U Summer Interns!